With the Coventry and Warwickshire Year of Wellbeing now underway, we want to know if you have an inspiring pledge to share for 2019! We've already shared lots of your pledges, but we plan to share many more throughout this exciting year. Today we share Project Support & Operational Finance Officer in Education & Skills, Becky Twi​te's inspiring pledge. In June of 2018, Becky took part in the 10K Wolf Run, but she was unable to do the whole course, generally the components involving water, due to risk of infection. This was because she was undergoing chemotherapy for breast cancer at the time. 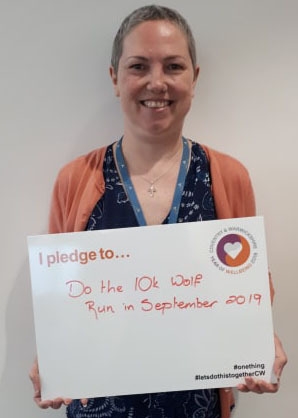 Becky has since been given the all clear last November, so has therefore pledged to do the whole of the 10K Wolf Run this September. What a fantastic pledge and inspiring story for our Year of Wellbeing! Becky will be doing the run in aid of Cancer Research UK. Along with colleagues and friends, Becky also took part in the 10k Race for Life in July 2018 and raised over £1,500 – so is hoping to try and beat this for her next run! Well done, Becky – the whole of Coventry City Council are behind you and we're sure you'll do fantastic in the Wolf Run! If you have an inspiring pledge you would like to make and share with us, don't hesitate to contact Catherine.Aldridge@coventry.gov.uk or Jade.McKenna@coventry.gov.uk to arrange to talk further and have your photo taken with Year of Wellbeing materials. With so much to celebrate there's never been a better time to get involved for you, your family and friends, your work and your community. You can read more about the vision in the Year of Wellbeing booklet. For further information on the year itself, contact janecoates@warwickshire.gov.uk or Ian.Andrew@covwarkpt.nhs.uk. You can also visit Year of Wellbeing website. #onething - What's your #onething pledge for the year?